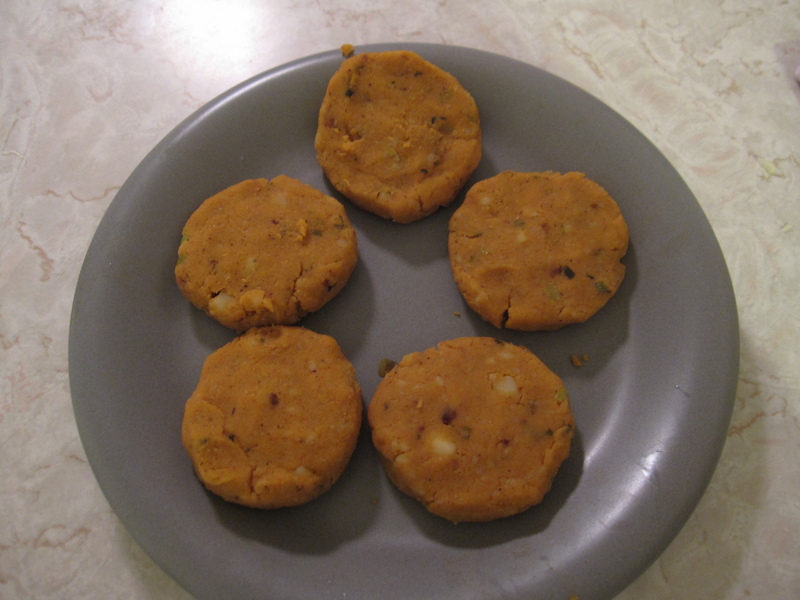 When I was traveling in Ecuador, I ate these delicious potato patties called llapingachos. They were filled with cheese and served with avocado and tomato slices. I had a craving for them recently and decided to try and make them at home. I roughly followed the recipe I found on the website Laylita’s Recipes, a great place to find recipes for Ecuadorian food, but I made a few substitutions/additions to the recipe. I substituted the achiote with paprika which was something I read online you can do (surprisingly, I had a hard time finding some achiote in the stores in my neighborhood). I used green onions instead of white onions because I had those in my fridge. I also used a different kind of cheese that was recommended in the recipe I was following. I wanted to use the same type of white cheese they use in Ecuador called queso blanco, or “white cheese”, but had no idea if it was available here or what was the equivalent. I did some searching on the internet and found a couple cooking blogs/sites where people were discussing this very thing. 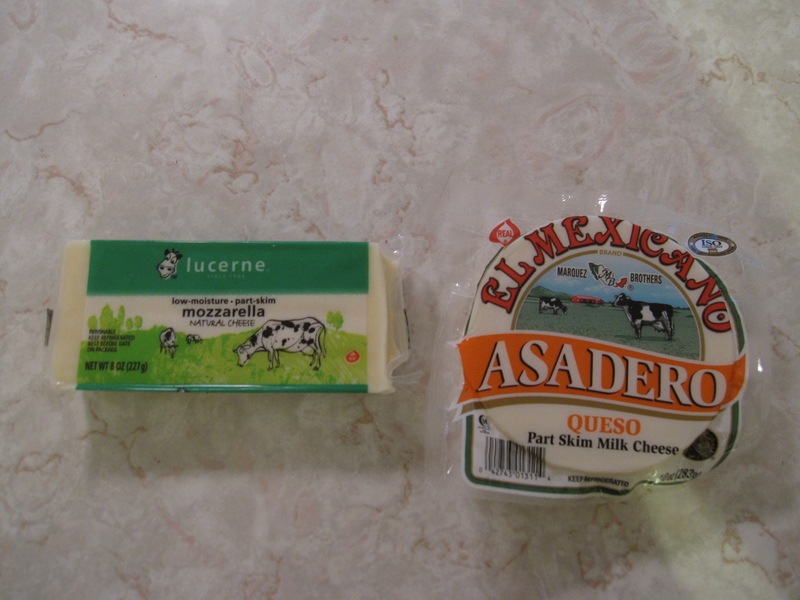 Some recipes that called for queso blanco (including the one I was looking at for the llapingachos) said to use mozzarella or Monterrey jack cheese. In looking at several different llapingachos recipes, it seems like any white, mild cheese that melts well will work. I used Mexican asadero cheese which someone recommended as a good substitute for queso blanco. 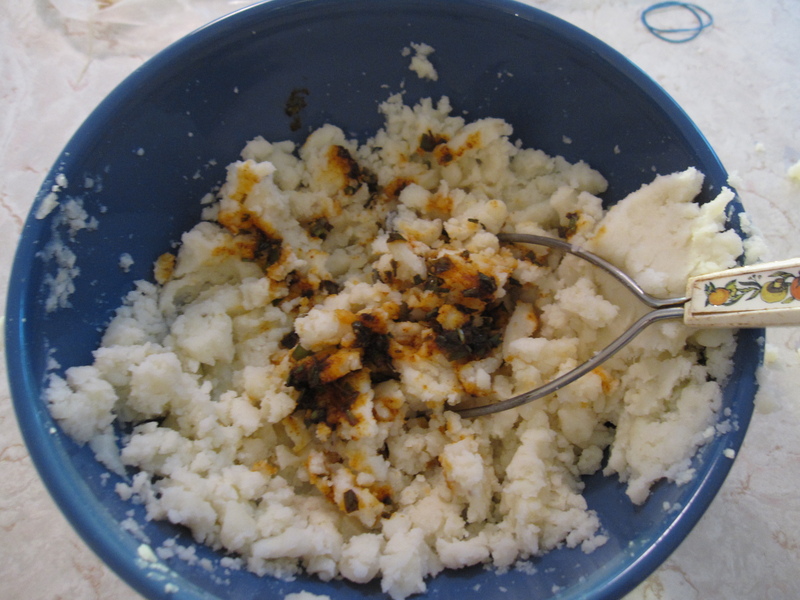 One last thing I did while making the patties was to set aside some of the mashed potatoes to make bacon llapingachos. I have never had them with bacon, and am sure any Ecuadorian reading this is probably horrified at what I’ve done to the llapingachos, but I love bacon and always try to find ways to include it in my food. So I crumpled some into the potato mix and made a few llapingachos with it. 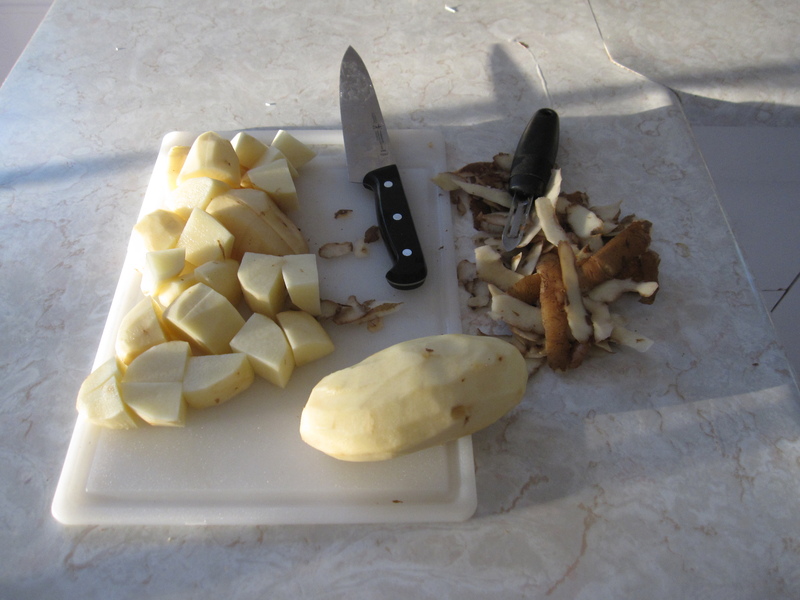 Peel and cut the potatoes into chunks. Boil the potatoes until they’re soft. Heat the olive oil over medium-high heat. Add the onions and paprika. Cook them until the onions are soft, about 5 minutes. 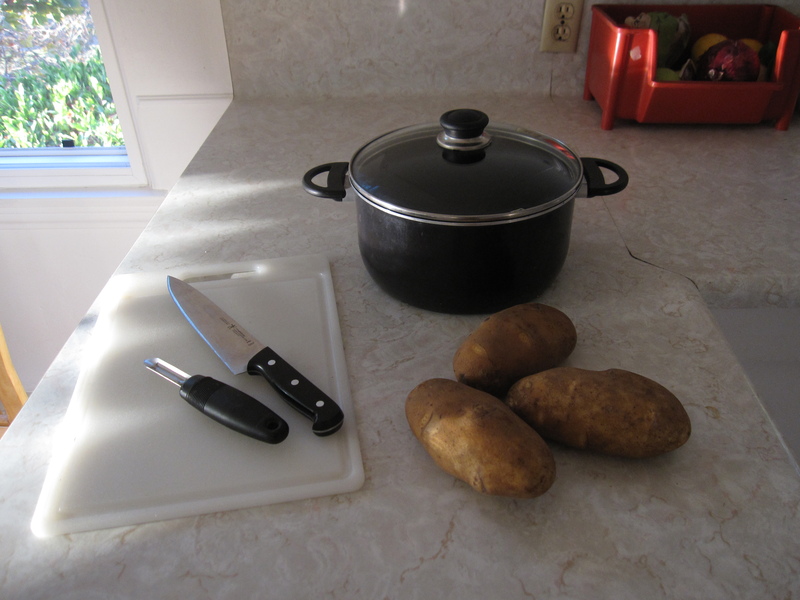 When it’s all mixed together, cover the potato and let it sit at room temperature for about an hour. 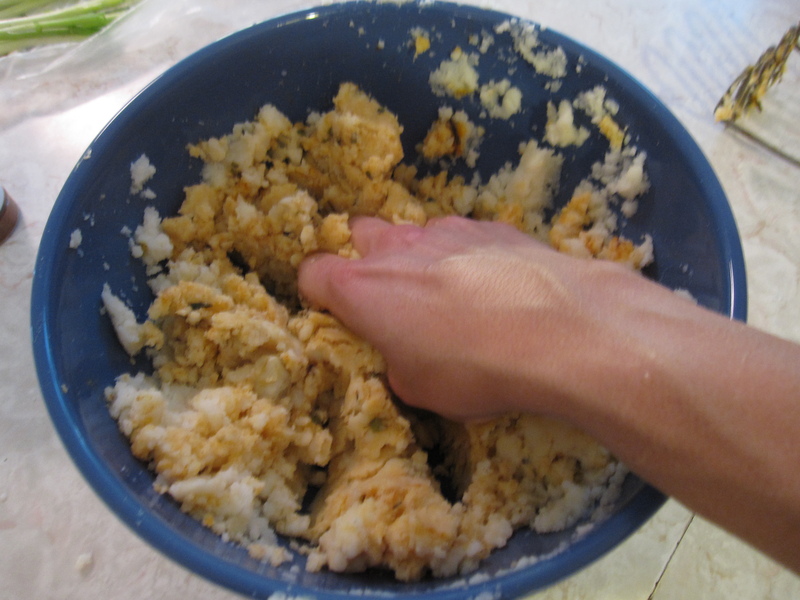 Shape the potato mixture into small balls (about a golf ball size). 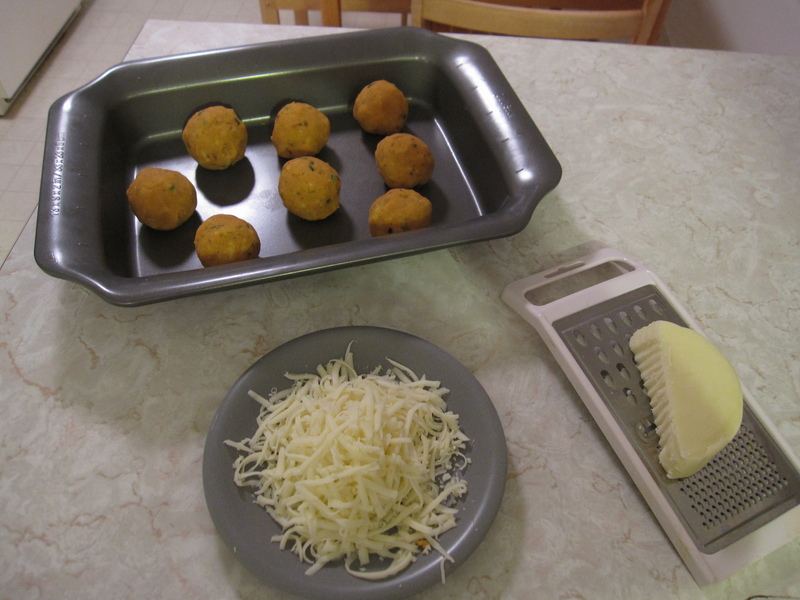 Make a hole in the middle of each ball and fill it with grated cheese. Once you’ve added the cheese, shape the ball into a thick patty. 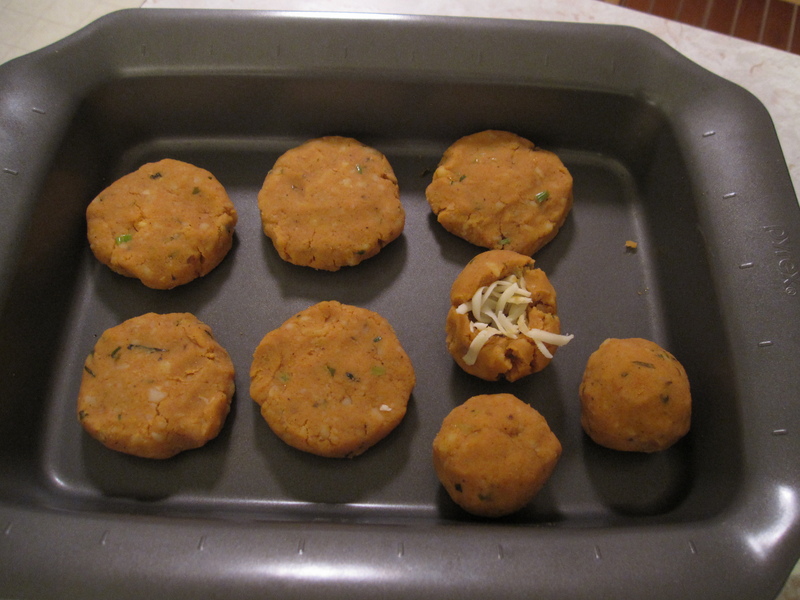 Place the patties in the refrigerator for 1/2 an hour to an hour. 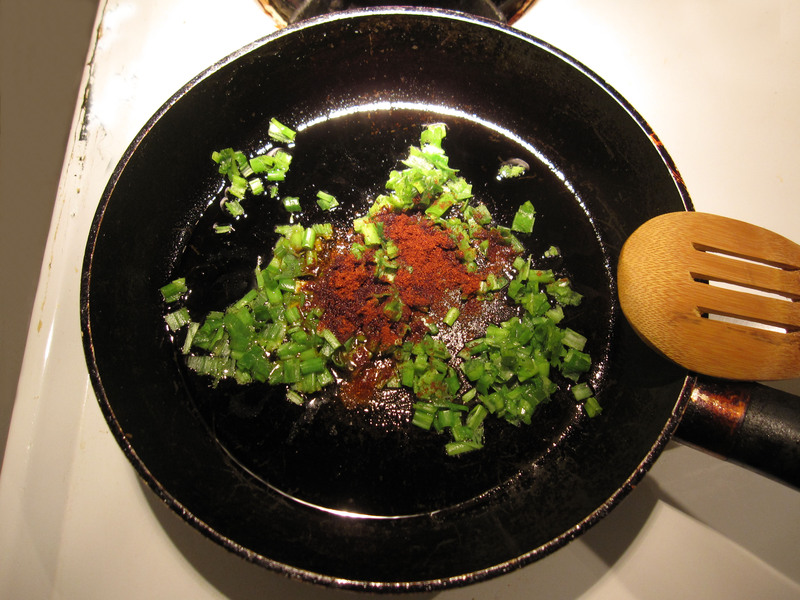 Put a very small amount of oil or cooking spray in a pan or hot griddle. 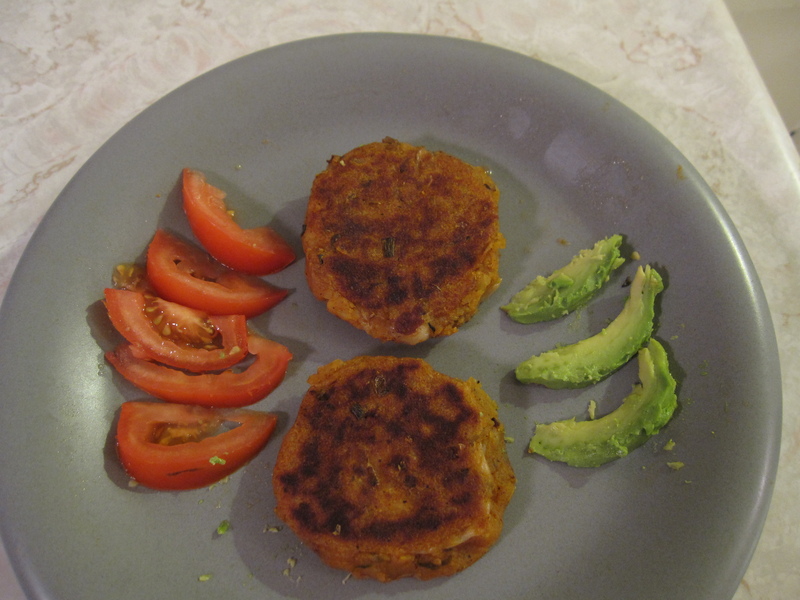 Cook the patties on medium to high heat until they are brown on each side. 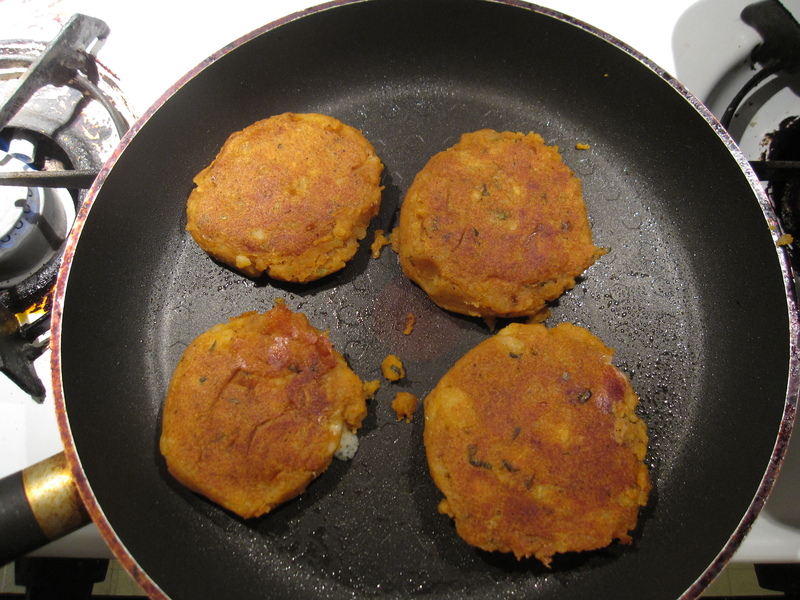 Be careful when turning the patties because they can break apart (try to not turn them so much during cooking if you can). *After mixing the potato, onion, and paprika together, I set aside a small amount of the potato mixture for the bacon llapingachos. 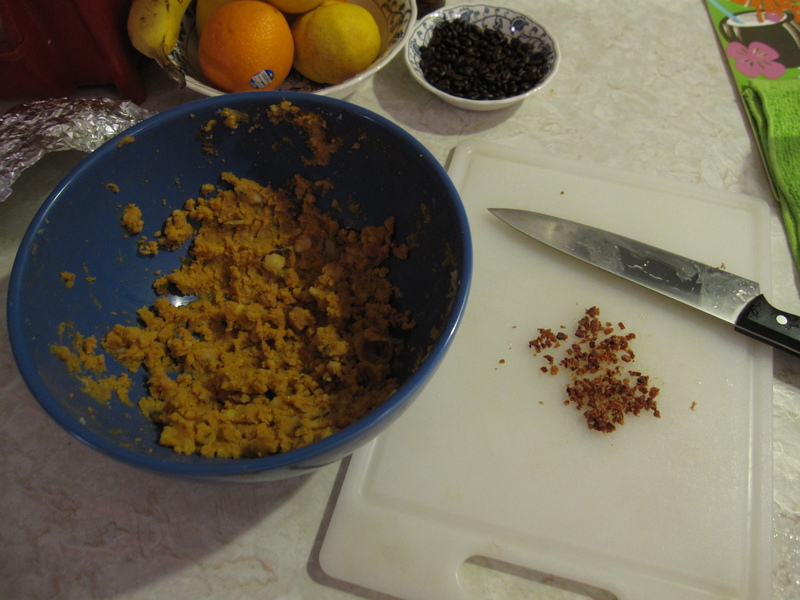 I added cooked, crumbled bacon to the mixture and then followed the rest of the steps to cook them. I served my llapingachos with tomato and avocado slices, but they can also be served with peanut sauce or onion and tomato curtido. My first llapingachos didn’t turn out too bad. I felt that the amount of paprika I used initially didn’t color the potato mixture enough. 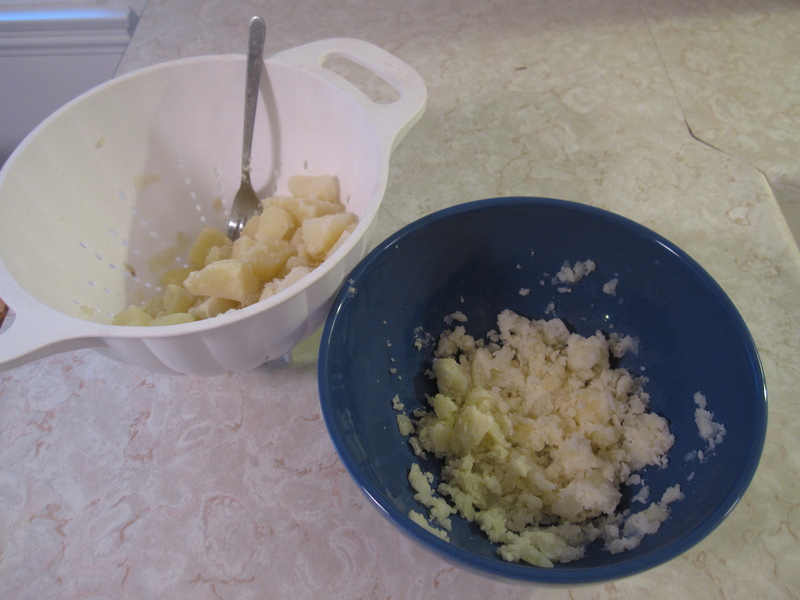 I added some more (about 2 more teaspoons) until I felt the potatoes were colored enough, but it made the patties look darker than I had seen them in Ecuador (they were yellower). I also thought they tasted too paprika-y. I will definitely try to make them with achiote the next time and see how it compares to the paprika. Also keep an eye on how much cheese you put in, if there’s too much or the cheese is too close to the edges of the patty, it will ooze out during cooking. I personally liked this because it made the cheese a little crisp, but you may not want that. 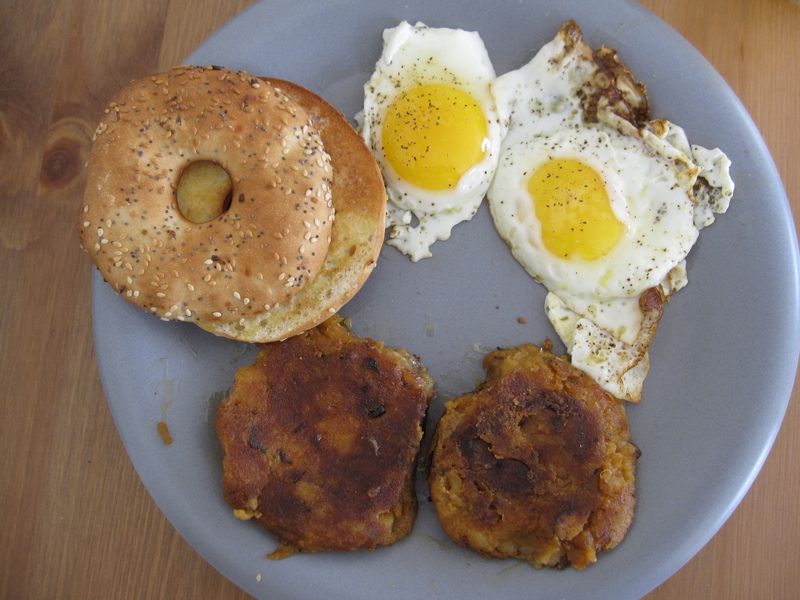 Oh and the ones with bacon…delicious of course. If you have leftover llapingachos, you can always reheat them in a pan the next day and have them for breakfast. This is how they were served to me one morning in Ecuador when we had leftovers from the previous night’s dinner. They were just as good and perfect to eat first thing in the morning.